Philippines: Is Duterte following in Marcos’ footsteps? The coming to power on 9 May of president Rodrigo Duterte marks a sharp turn in the politics of the Philippines. Duterte has a reputation as a strong man who ruled as Mayor of Davao City with an iron fist. His shoot-to-kill policy against alleged criminals and drug dealers has claimed 1,000 lives in the first two months of his presidency – half of them slain by shadowy death squads. Human Rights Watch slammed this as “state sanctioned butchery”. Duterte also threatened to declare martial law in response to reports that the Supreme Court might intervene to block his hardline policy against street crime. At the same time, Duterte has boasted he is the country’s first ‘socialist’ president and has invited representatives of the Communist Party of the Philippines (CPP) into his cabinet, and uses populist rhetoric against foreign mining companies and sections of the establishment. On the other hand, his alliance with the family of ex-dictator Ferdinand Marcos, which remains an influential force in the country’s crony political system even after the dictator was overthrown in 1986, led Duterte to announce yet another highly controversial step: allowing Marcos’ embalmed corpse to be buried in Manila’s Heroes’ Cemetery with full military honours on 18 September. On Sunday, 14 August, over one and a half thousand people rallied in Rizal Park, Manila to condemn this plan, organised by liberals and some left groups to protest the thousands of activists imprisoned and tortured under Marcos before the ‘People Power’ movement ousted him. Gabriel, gave his views on the new president and what he represents. Vincent: Duterte has been compared to Donald Trump, another erratic right-wing populist figure. How would you sum up his politics? Gabriel: Like Trump, he’s impossible to map neatly on the political spectrum. At best he’s a populist with a more authoritarian bent. His election campaign rode on the promise of change – which has meant different things to different audiences. Repeatedly he would sway from left to right on everything from his stand on foreign investment to the rights of LGBTs and trade unions. Duterte is first of all a reflection of the state of Philippine politics in general. Most conventional or traditional politicians (we call them ‘trapo’ here, meaning dirty rag) and parties don’t run on concrete platforms, much less a class-based one. Their votes depend on their connections to the electoral machineries of whatever is the ruling political party. In the provinces, political dynasties are useful instruments for garnering votes, although sometimes they can stand in opposition to the central government. Duterte is himself a member of a political clan in the Southern Philippines, making him a representative of this faction of the oligarchy. Part of his appeal lay in him being a candidate from Mindanao, the “neglected south”. Political turn-coatism is also commonplace, given that the mainstream parties don’t really stand for anything apart from their brand names. Winning an election here is really a matter of having (1) the right connections, and (2) saying popular things at the right time. Secondly, Duterte is an expression of current frustrations at the political elite, as much as he is a product of the social conditions over which he governed in Davao city, in Mindanao, for over two decades. He has earned his reputation as a strongman who will get things done, as a marked contrast to the departing Aquino administration which was seen as corrupt and inept, despite its promises of reform. Davao under Duterte is repeatedly compared to Singapore under Lee Kuan Yew, but this is greatly exaggerated. Davao is no Singapore, and remains notorious for drugs and crime. The latter are rather symptoms for deeper, structural crises that Duterte promises to do away with at the national level in the same manner that he’s dealt with them in Davao: strong-arm rule, death squads, Machiavellian manoeuvring with both the left and the right. Ultimately Duterte will prove unable to resolve the problems he set out to defeat. Already his economic platform promises no departure from that of previous administrations [i.e. neoliberalism]. He has also appointed cabinet members from a different faction of the same political oligarchy, gravitating toward allies of the former Gloria Arroyo administration (2001-2010). The comparisons between him and Trump are understandable, given that the Philippine and US elections were happening at the same time. The parallels between the global and local conditions that gave rise to both are striking. References to fascism in Duterte’s case are a bit overblown; his politics tend closer to what’s typical to strongmen or ‘caudillo’ figures in Latin America or Southeast Asia. Duterte’s brand of politics is an authoritarian populism. He will be working on drawing the security apparatus closer to the executive, while in the past he has also joked about closing down Congress. Vincent: Duterte entered the election race late as the dark horse candidate. What factors do you think allowed him to emerge as the winner and where does his support mostly come from? Gabriel: Over the course of the presidential elections, he wasn’t seen as a real threat to the other candidates, and was regarded as something of a clown. Only much later people realised he had a viable chance at the presidency. Roxas, the Aquino administration’s Liberal Party (LP) bet, early on didn’t think Duterte would have much of a chance. Drunk on the outgoing administration’s own perceived success, Roxas’ main message was continuity in the form of Aquino’s “daang matuwid” (straight path) of reforms. In reality frustration has been building over the past two years at the outgoing administration’s blunders, chiefly over its management and response to major crises like typhoon Haiyan (regarded as the worst storm in history with over 6,000 killed). Duterte drew support from all social groups, but mainly among the lower middle classes. In that sense this is something of a revolt of the middle class, except that he also has the backing of significant sections of the working classes, especially the urban poor. If you look at the numbers though, like other presidents, he won by a ‘majority’ of below 40 percent of the electorate – over half of the voting population did not support him. That said, the 2016 election saw one of the highest voter turnouts in the country’s history. Duterte has also had the support of some of the most reactionary factions of the bourgeoisie, including the Filipino Chinese Chambers of Commerce, made up of local business groups that profited less from the economic growth of the past six years under Aquino, compared to other factions of the capitalist class, including foreign investors, retail and real estate magnates. This layer would like to see a more efficient government bureaucracy better able to protect their investments by quelling petty crime and social unrest. It’s important to note that Duterte did not emerge –as one might expect – in the context of an open economic crisis. In fact the elections occurred in the midst of a supposedly booming economy – at least if the opinions of the World Bank, Bloomberg, and foreign creditors are anything to go by. GDP grew by 6.4 percent in 2015. The fact of the matter is that, at least for the majority of the country’s working classes, life has always been one of crisis and insecurity. The gains from economic growth have always been exclusionary, with profits going to a politically well-connected bourgeoisie – at times benefiting a small middle class in the capital, Manila. Real economic development is strangled as cronies, dynasties, transnational corporations, and regional warlords dominate the economy. The confidence the Aquino administration had in the ‘success’ of its own political and economic reforms speaks to the blindness of the political elite and their detachment from the realities of the majority. Duterte fitted perfectly into a political vacuum that the left was unable to fill. Vincent: What is the Communist Party of the Philippines’s (Maoist) position on Duterte? In what way can he claim a ‘left’ label? Gabriel: The CPP is by no means united on the Duterte question. Its electoral formations leaned toward Grace Poe’s presidential candidacy in the first instance, while Joma Sison, the party’s official spokesperson has always spoken favourably of Duterte. It has released official statements critical of Duterte while at the same time favouring a “critical honeymoon period” with the man. It is unclear who is really making the decisions within the party. The CPP has cultivated a long relationship with Duterte in the Davao region. Members of the party there, and the Southern Mindanao command of their armed wing, the New People’s Army (NPA), clearly leaned toward Duterte. He was known for being able to negotiate between government forces and the NPA in Mindanao, even securing the release of political captives from both sides. The CPP’s front organisations were at times able to work with Duterte in securing some political gains for small farmers, the urban poor, indigenous peoples in the Southern Philippines, especially against large-scale mining and logging companies. But this is not Davao now. Duterte governs an entire country where big money, big power, and big guns matter more to sitting presidents than alliances with any leftist formation. Some sections of the CCP leadership clearly believe that Duterte represents a chance for a viable peace process that would see an end to a “protracted peoples’ war” [rural guerrilla warfare] that has claimed over 30,000 lives. Duterte has given the CPP four cabinet posts, including in the labour and agrarian reform ministries. This was premised on the condition that the NPA lay down their arms. The CPP got around that clause by saying whoever they nominate won’t be members of the party per se but members of their legal fronts that are “nationalist” and “progressive”. The CPP is also banking on Duterte’s commitment to revive the country’s steel industry. There are illusions that national industrialisation is still possible through partnerships with a given class of “national bourgeoisie”, which is in reality bound hand and foot to foreign capital and has no real progressive dimension. But it’s not just the CPP that is joining the Duterte bandwagon. Another broad ‘left’ party, Akbayan, joined a coalition of party lists in Duterte’s camp (PDP-Laban) in Congress. With a majority of ‘trapos’ having already joined Duterte, this is likely to ensure a legislative majority to ram through Duterte’s economic and political reforms, particularly the reimposition of the death penalty and the revision of the constitution to lift the cap on foreign ownership of local investments and further liberalise the economy. Akbayan similarly joined a coalition under the Aquino administration and some of their members secured important cabinet positions, including presidential spokesperson. But in the case of Aquino, they had already formed an alliance over the course of the 2010 elections. By contrast, Akbayan never considered going into an alliance with Duterte’s party. In fact, members of its leadership were highly critical of Duterte – so the sudden shift is alarming, if not really surprising. This makes them little different from former members of Aquino’s LP who’ve jumped ship as well. This means there is no viable opposition among the self-defined left. In both cases, the strategy consists of thinking that the left ‘wins’ when members of particular parties are in government – rather than seeing their role as an opportunity to raise the political programme and put a distinct and independent alternative across, for political opposition to emerge from the bottom up. This can’t bode well for the rest of an already fragmented left who remain critical of Duterte. Should they decide to go this route, the ‘left’ will for a long time be tainted by an alliance with Duterte, diluting what progressive politics even means, which is almost everything Duterte is not. Vincent: Based on the make-up of the new government, what kind of economic policies will be pursued and what will this mean for ordinary people and the poor? Gabriel: At best, no real change from the current trajectory. Indeed the stock market and investors heaved a collective sigh of relief after Duterte announced his “8-point economic agenda” – which is the usual neoliberal menu of investment liberalisation, tax reform, with some tentative references to agrarian reform and industrialisation, that one would expect from any of the previous presidents. In speeches before business groups, Duterte has repeatedly committed to offering a friendly environment for foreign investment. In addition, his push for federalism appears guaranteed to strengthen local political dynasties while favouring investors that want states to compete among themselves in a race-to-the-bottom on working conditions. Despite the CPP’s illusions to the contrary, Duterte is no Chavez. This is not our Latin America moment – of leaders riding on the crest of mass protests, strikes, and social pressure to deliver improvements for the masses. What Duterte offers is a kind of neoliberal authoritarianism – rule by a strong executive with an expanded security apparatus while leaving the technocrats in charge of the economy and providing a progressive facade by inviting members of the ‘left’ to be on his side. Vincent: Can you see a popular backlash and protests coming in the future – as for example against president Estrada in 2001? Gabriel: Duterte’s populist streak has in the past been compared to Estrada, popularly known as Erap. But Erap’s base of support was solidly among the urban poor. The ‘People Power II’ protests that overthrew Erap in 2001 were mostly led by the urban middle classes, with the CPP joining the fray. But this buried smaller revolts among urban poor groups that felt it was a ‘coup’ against their president. Duterte’s appeal at this stage cuts across classes, so he has actually had a pacifying effect on public unrest. His ability to build widely different political coalitions in his favour makes him an unusually useful prop for the ruling class. Mass protests against his rule are unlikely in the near future in my opinion. There were some rumours that Aquino would host another ‘People Power’ against Duterte should he win, but his overwhelming popularity at the present time appears to have made an elite-led coalition against him unlikely. Instead there appears to be a convergence of elite opinion around Duterte. Given regional tensions with China and a steadily growing economy, domestic stability is foremost on the minds of other factions of the political elite as well as the US foreign policy establishment. But given perpetual political instability, the faith people have in Duterte can just as rapidly turn against him. One positive development that has emerged out of all this is the fact that it has exposed the bankruptcy of political elites who pose as reformists, as Aquino did. Part of Duterte’s stylistic appeal was the fact that he stood as Aquino’s antithesis. Should Duterte himself prove disappointing, it will become clearer than ever that change can never come about through the actions of one man, or by a mere change of president, but rather requires a collective struggle by the majority against the entire oligarchy. Vincent: This was an election with only capitalist and elite candidates; there was no option representing the working class and the poor. What is the way forward for creating a real left alternative? What we lacked was an independent political alternative based on an explicitly class-based programme – one that exposes the bankruptcy of our so-called democracy, showing its root causes. The association between the ‘left’ and Duterte will be hard to break, especially given that the latter has openly described himself as a ‘leftist’. 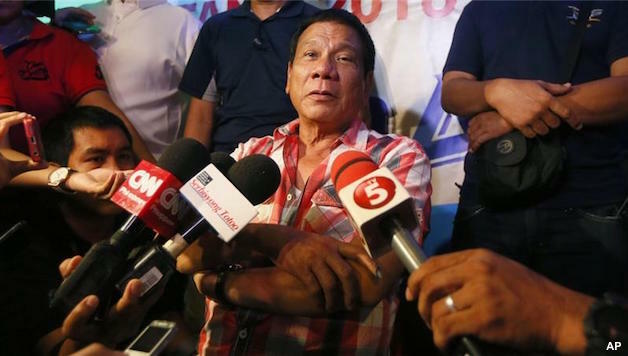 Given the way the self-ascribed Philippine left – Maoists, social democrats, other progressives, even liberals – are now gravitating around Duterte, you’d think we elected Nelson Mandela or Che Guevara as president! There is space, in the future, for a movement that can in turn lead to the formation of new political parties. This cannot be a repeat of ‘People Power’, which essentially pivoted around individual ‘heroes’ and factions of the oligarchy. Forwarding an independent alternative will probably entail a break from the traditional left parties. I personally still hold out some hope that bridges can – and must – be built with at least some individuals within the CPP’s ranks. Previous articleZimbabwe: Mugabe Must Fall!